Salva has released his new album Complex Housing via Friends of Friends Music and is available in a baby blue vinyl edition. He also premiered a new video for their track "Keys Open Doors" today on Pitchfork Tv, and released a new podcast via xlr8r. Paul Salva is really pushing Chicago house into a new realm with this one. Salva will be performing at SXSW on 3/18 @ 9pm at the Surefire Showcase @ Barcelona. SXSW 2011: Boston to Austin March 17 12-6pm at the 512 -- Tons of Boston Bands!! If you're in Austin tomorrow for St. Patrick's Day what better way to celebrate the holiday than by seeing a plethora of Boston bands? DigBoston and Converse will host the Boston to Austin showcase tomorrow, March 17, on the roof of the 512. The party starts at noon, be sure to stop by and see Viva Viva, The Dirty Dishes, Bodega Girls, Mystery Roar, Mean Creek, Kingsley Flood, Static of the Gods, Banditas, Endless Wave and DJ Die Young. Lady Lamb the Beekeeper will be playing the Brooklyn Vegan Showcase at Swan Dive in Austin, TX tonight. The Portland, ME native, who recently transplanted to Boston, is a folk-rocker with the voice of a fallen angel. This performance is the artist's Austin debut. She goes on at 8pm. Also playing are: Olof Arnalds (Iceland), Ted Leo (Washington DC), Sam Amidon (from VT, now in NYC), Sharon Van Etten (NYC), & Evan Voytas (LA). Eleanor Logan has a lot of loud friends, but somehow her unadorned voice always manages to be heard above the din. If her music's any indication, she must be one of those people who always gets what she wants without having to demand things go her way. Known primarily for her work with the early grunge-nostalgic trio Adult Themes, the Brooklyn artist has just released a 2-song 7" courtesy of Crikey! Records under her new solo project, Happy New Year. Where Adult Themes hash out a fun but tried-and-true noise rock formula, Happy New Year seems more than happy to include any sound within its sonic washing machine. Guitar-driven fuzz and aggressive percussion hits surround Eleanor as she sits pretty in the middle of all the action. It's intense and calm, focused and chaotic...kinda hard to put your finger on, which only makes it more interesting. She promises another song next month, so I'm looking forward to hearing what she sticks in the blender this time. 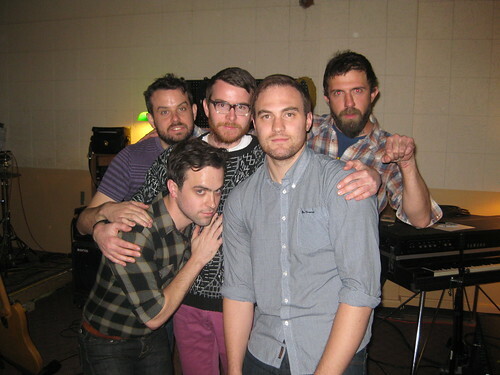 Interview w/The Deli's Philly Best Emerging Artists Poll Winners: Sun Airway! If you live in Philly, you should be quite familiar with The Deli’s Philly Best Emerging Artists Poll Winners, Sun Airway. Well, this week the former A-siders will be descending down to SXSW to perform anywhere and everywhere as many up-and-coming indie acts tend to do, but we are certain that our champs will leave their mark on this year’s festival. We had a chance to catch up with Sun Airway’s Jon Barthmus before he started his journey down to Austin, and surprisingly there wasn’t much talk at all about this week’s chaotic schedule of events (you can find Sun Airway's SXSW schedule as well as other Philly acts here). But Jon was nice enough to share with us some of his personal favorite things and possible future plans on the horizon for Sun Airway here.